Canned craft beer pioneer Oskar Blues knows a little something about aluminum, so it makes sense that the brewery’s non-profit, The CAN’d Aid Foundation, is launching a national aluminum recycling program. With generous grants from long-time partners, The Ball and Alcoa Foundations, CAN’d Aid’s first national initiative will kick off this summer and concentrate on can recycling education and activation. Recycling stations like the one above and seed money help communities create sustainable recycling programs. CAN’d Aid will offer funky and unique programs, focused on keeping aluminum in the recycling stream. “Grassroots Recycling Grants,” funded by Ball and Alcoa, are now available for communities, organizations and individuals interested in starting sustainable recycling programs. CAN’d Aid will provide seed money and equipment to kick off initiatives to those who apply and outline a plan for awesome results. Novelis, the world’s largest aluminum recycler, and Colorado-based ZeroHero will work directly with successful grant applicants to provide education, training, on-site support and reporting. ZeroHero’s unique recycling stations effectively corral all recyclable and compostable materials and have helped countless organizations make the move toward less waste. The goal of the grants is to empower motivated and passionate individuals to make a difference in their communities through recycling. The educational components of the program focus on the benefits of “infinitely recyclable” aluminum and include online webinar training and event coaching from ZeroHero. Among the first to be awarded a recycling grant was Eau Claire County Recycling, which oversees recycling and waste removal for the entire county of Eau Claire, Wis. (population 100,000). The organization was awarded 10 recycling stations plus cash to implement recycling programs at their annual summer “Taste of the Valley” culinary arts festival and weekly concert series. “CAN’d Aid provided us with the tools, education and training to implement this program, and we’re able to effect real change and produce measureable results around recycling. We are grateful to the foundation and ZeroHero, and look forward to seeing how many pounds of recyclable materials we collect this summer as a result,” said Amanda Haffele, Director of Eau Claire County Recycling. Western North Carolina Alliance, an environmental advocacy group based in Asheville, N.C., also has been awarded a recycling grant. WNCA will provide on-site recycling support at the Oskar Blues Burning CAN Beer Festival on July 5, and afterwards will place the recycling stations into permanent use throughout Western North Carolina. Since announcing the program, CAN’d Aid has awarded $12,000 in cash and 18 reusable recycling stations have been granted to four nonprofits across the country. Funds and equipment are still available and the foundation’s goal is to award at least a dozen more applicants this summer and fall and continue the program in 2015. In addition to recycling grants, consumers will have the opportunity to participate in the #ShowUsYurCans social media campaign (see above) by posting photos and stories of how they’re making a difference through recycling all summer long. 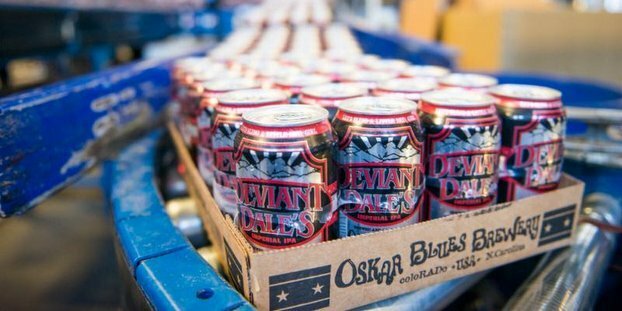 As part of the Oskar Blues Ordeal, CAN’d Aid has set a goal to recycle 1 million cans by the end of the year.